Everyday, I find myself bookmarking sites and reading tweets, blog posts, etc. about great uses of technology in the classroom. One of the areas I have been paying close attention to is the use of Evernote in the classroom. 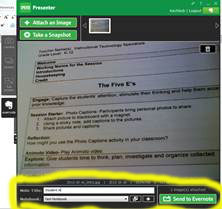 Evernote and its integration with the IPEVO document camera makes it a powerful combination to be used as an electronic writing portfolio. So how would that work? 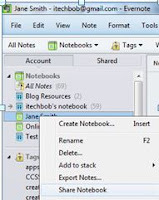 First, you would setup individual notebooks for each student in Evernote. To do this, click File and then New Notebook. By setting up a notebook for each student, teachers can share each individual notebook with parents. This makes for great home communication. 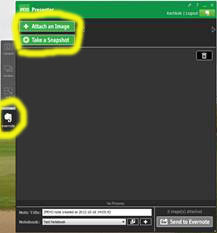 To share a notebook, right click on the notebook and choose Share Notebook. From there, you can invite parents to view the notebook via email or you choose to make a public link. That link could then be sent to the parents. As you continue to update the portfolio, parents can use the same link to view their child's portfolio. Students could also see their portfolio and look at how they have grown as a writer throughout the year. Once the notebooks are setup in Evernote, it is now time to start adding student work to the electronic portfolio. Images can be captured and inserted into notes within Evernote in a multitude of ways. If you have an IPEVO document camera (for around $70 it is a great deal), then this process is simple because Evernote integrates into the P2V software that comes with the IPEVO document camera. 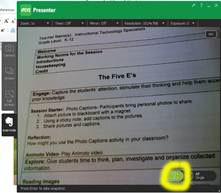 When in the IPEVO software, you click on the Evernote tab and sign into your Evernote account. Once signed in, you click "Take a snapshot". 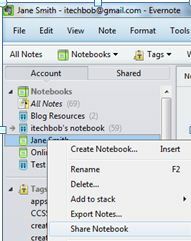 Finally, give your note a title, choose the notebook you want to put it in, and click Send to Evernote. You can take multiple pictures and then attach them all to a note. The IPEVO and Evernote integration makes the process of creating a digital portfolio so much easier. Try it out and let me know what you think!